If you’re a fan of tasty, sweet macarons, learn a little bit of what goes into making them and discover a few of The Magic City’s finest specialty shops devoted to the petite pastry. If clouds were edible, they’d be these crispy on the outside, cakey on the inside, chewy sandwich cookies of French extraction. Not to be confused with macaroons, a creation of almonds, coconut shavings and condensed-milk dipped in dark chocolate, French macarons use only 6 ingredients: almond meal, egg whites, powdered sugar, flavoring, food coloring and fillings that can include anything from fruit preserves to buttercream frosting and ganache. It makes one wonder why everyone’s fussing about something so seemingly unassuming and the answer is that these creations are the result of an intensive labor of love, as there are more than 20 time-measured steps that, if ignored, means certain doom for both chef and enthusiast alike. In town, Atelier Monnier is your own private Bordeaux in the heart of Brickell, but beware the sweet air. The dining room carries the concentrated fragrance of pastries and café au lait that can’t possibly be safe for diabetics. Let your eyes take in the multicolored counters splashed with various hues like edible works by Romero Britto. This place is a fully functioning restaurant, but if you’re going for dessert first, think pink as in Rose, Raspberry & Strawberry Macarons; 848 Brickell Ave.; 305.456.5015; AtelierMonnier.com. A bit south, Janette & Co. is decorated like a house of high-fashion with a pastel color scheme and plenty of soft lighting. The gelato gallery boasts works by Stracciatella, Zabaione & Fleur De Latte, and the artisanal chocolate display is bursting with hand-painted masterpieces. If you think you’d be the first person to devise a Cold Stone-esque concoction of gelato, macarons and chocolate mix-ins…you’d be wrong, but by all means don’t let me dissuade you. If fortune favors the bold, then Basil-White Chocolate, Chocolate-Pear & Salted Caramel are their treasure troves; 5811 Sunset Dr.; 786.264.8638; JanetteAndCo.com. Over on Lincon Road, The French and Italians are willing to go to war over who invented the world’s finest cookie and that’s fine. Meanwhile, we’ll sneak behind enemy lines and eat all their provisions at Ladurée. 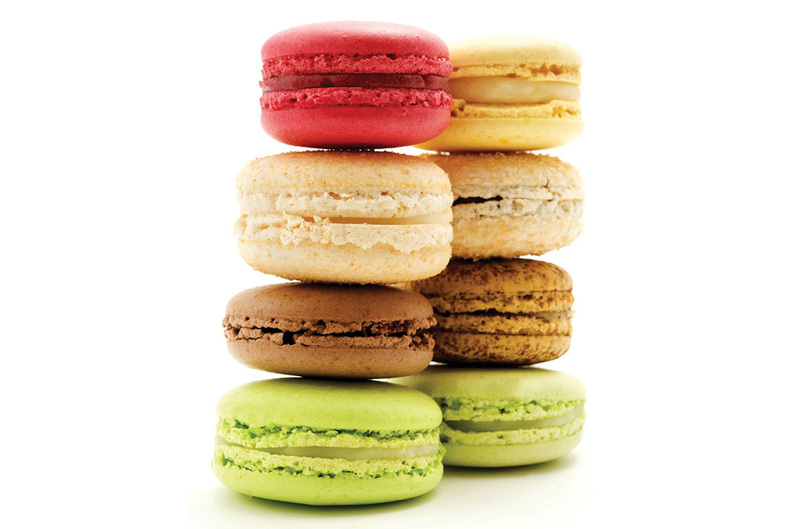 Regardless of who’s right, the French Macaron as we know it was first produced at Ladurée’s Parisian pâtisserie. There are fewer flavors, but more attention to detail, as you’ll notice on their hand-decorated tops. Fleur d’Oranger and Cassis are part of their greatest hits collection, but the exclusive and seasonal Marie-Antoinette, or Anise-Rose flavor, is one that pairs exceptionally well with the robust tea of the same name; 1118 Lincoln Rd. ; 786.275.6621; Laduree.com. As a gift, as an apology, or when raindrops keep falling on your head, these little luxuries are always welcome. So go ahead and consume them to your heart’s delight. No one’s going to judge you. But they most certainly will ask for a bite.